Ol' Myrt here has been pretty darned stoked since last Friday night when I inadvertently discovered that I have a 4th Union Civil War ancestor. I'd spent more time than I'd care to admit cleaning up my RootsMagic "place" list as reported in my blog last week. Then I got to working through some of my ancestral lines long since ignored, merely comparing what I had in my database with what Ancestry.com's computers had discovered for me. I found the Union Civil War Enlistment paper for my 3rd great-grandfather, Lewis L. Terry. Ancestry.com's online Family Trees has a "shaking leaf" option points to possible matches in basic record groups like census records. 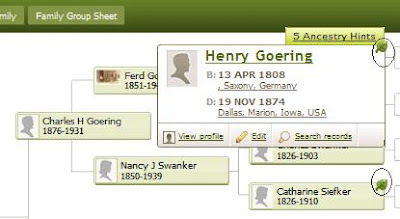 I had previously uploaded my family tree into a semi-private area online at Ancestry.com, thereby allowing the Ancestry.com computers to automatically do their "shaking leaf" look for matches. Note below that two other ancestors have "Ancestry Hints" as indicated by the "shaking leaf". When one rolls the mouse of the leaf, the number of hints is indicated. If one clicks the leaf, one may review the hints, accept or ignore them as appropriate. Previously, I'd only known that Lewis was born in Hamilton County, Ohio. I hadn't found him in military records or post 1850 census records there, which would mention his daughter, one of my proved ancestresses. I was simply lost and went on to climb other branches of the family tree. But THANKS to Ancestry.com's "shaking leaf" option, Lewis L. Terry shows up consistently in Daviess County, Missouri. Ancestry.com found census records in a place I couldn't have imagined. And it had been some some five years since I last searched census records for this man. In those "olden days" census indexes were poor to say the least. The Lewis L. Terry household was enumerated on page 81 of the 1860 US federal census was in Salem Township, Daviess County, Missouri, beginning with line 16. On a hunch, I turned to the Civil War Collection at Footnote to see if Lewis L. Terry had enlisted in the Union Army from the Missouri. Sure enough, Lewis [sometimes transcribed as Louis] L. Terry was born in Hamilton County, Ohio [yes!] signed his enlistment paper 19 August 1864, and was assigned to Company F of the 43rd Infantry Missouri Volunteers. 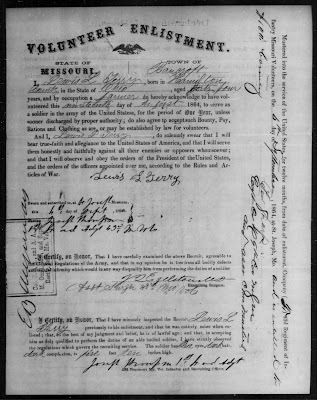 This and other documents in Lewis L Terry's compiled service record file are available online in a collection titled Compiled Service Records of Volunteer Union Soldiers Who Served in the Organizations From the State of Missouri. The original files are in the National Archives Publication Number 405, Record Group 94 described as "Carded Records Showing Military Service of Soldiers Who Fought in Volunteer Organizations During the American Civil War, compiled 1890 - 1912, documenting the period 1861 - 1866 ". It was such an emotional moment. A new ancestor to honor as a supplemental in the Daughters of Union Veterans. And although Ol' Myrt here carefully saved the file to my Dropbox, I couldn't quell the excitement at the new discovery. AMAZING that I could hold this original document signed by one of my 3rd great-grandfathers. YES, I know the digitized records are just wonderful, but it was a joy to hold the real document. Just call me a silly, emotional old white-haired genealogist. You got it! I am one, and I love it.